In the same week that the United Nations finally gave up trying to grab control of the internet, a group of three organizations led by domain-name overseer ICANN have launched an effort to become the internet's UN. 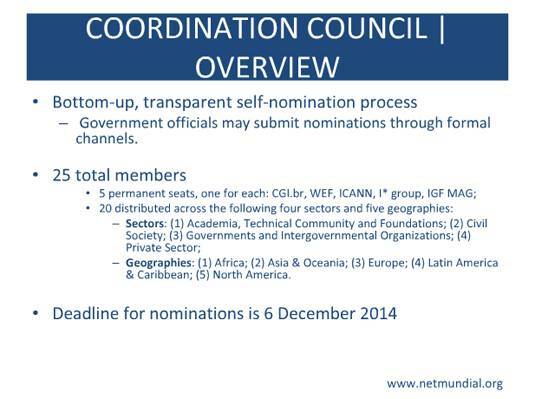 The "NetMundial Initiative" will be an "open source platform" and a "shared public resource" that will enable "calls for assistance on non-technical issues," representatives of three organizations – ICANN, Brazilian government-led CGI.br and the World Economic Forum (WEF) – said on Thursday. "If there is a cybersecurity issue, or someone who has figured out how to protect children through a browser," then they can use the platform to connect with others as well as crowdsource and fund their efforts, ICANN CEO Fadi Chehadé enthused. Unfortunately, the reality is quite different. There is no platform, not even a message board or chatroom. Instead, the initiative's website has a simple upload function for contributions (there are none at time of writing) and an application form for the initiative's "Coordination Council." That council, it was revealed, will be structured in the same way as the UN's Security Council, complete with five "permanent members." ICANN, CGI.br and the WEF have awarded themselves a seat each, and given the other two to the Internet Governance Forum (IGF) and a coalition of Internet organizations known as the "I-star" group. It's all completely open and free. Except we're in charge, ok? They announced that a further twenty members will be chosen (seemingly by the organizers) according to geographic region and different sectors, split equally between: academia; civil society; governments; and business. Attendees to the launch immediately started questioning the structure, with some asking why a council was needed at all, others asking who would decide on the other members, and all reacting badly to the creation of five permanent members, which the organizers thereafter referred to as "anchor seats". "Everything will be done bottom-up, this is the mother of all bottom-up processes," said Chehade to widespread disbelief in both the chatroom and on Twitter. The claim that the initiative would not overlap other organizations' work was also derided. "Why create another platform?" asked one person in the short Q&A session after the presentation. "How do you expect to avoid duplication?" "Why is ICANN on the Council? Precisely to clarify why our role should remain as it is: purely technical. It should not be at ICANN where these issues should be solved." Which is the equivalent of the President of the United States installing himself on the Supreme Court just to make sure the distinction between judiciary and executive is clear to everyone.